HomeFAQs – Which Video is Right for Me? Not sure where to begin or what Kettlebell Workout DVD’s to buy? Let me help you! Are you wondering why these DVD’s are so popular? Why are people raving about these so much? People of all ages have literally transformed their entire body from head to toe with these programs. The workouts are FUN, EFFECTIVE, very short, accessible, easy to follow, sustainable, and user friendly. Thousands of people continue to use this system because it WORKS!!! Our DVD’s are also available in a downloadable format for your iPad, iPhone, iPod or mobile device. If you are brand new to using kettlebells, a seasoned exerciser, or just looking to change things up starting with our most popular entry level DVD is the best place to begin. Thousands of people of ALL ages just like you, have learned kettlebells from this DVD alone and literally got stronger and leaner. Read the raving testimonials, reviews, and watch the trailer of what to expect here. 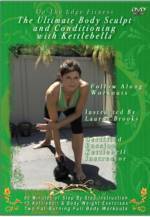 In this kettlebell DVD is Lauren Brooks and our walking fit testimonial in her early 50′s, high school teacher, Robin Duncan. View the trailer, reviews, and details of this DVD right here. This Volume 1 DVD can be purchased as a DVD or as a downloadable video for your iPad, iPhone, iPod, or any mobile device, or BOTH! Volume 2 is the next DVD you NEED that compliments Volume 1 perfectly. This is designed for the novice who has learned some of the basics all the way to the more intermediate and advanced user. If it ever get’s too easy, just grab a heavier kettlebell. As simple as that! Don’t miss out on this DVD. You can also request a written rotation plan on how to interchange both Volume 1 and 2 in a weekly routine for free. 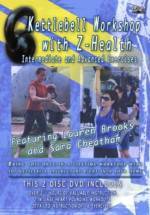 This DVD was filmed 6 months after giving birth to my second child of 8 pounds 6.5 ounces, via C-section!! These workouts are what made it possible for me to regain my strength and physique despite pregnancies with large babies and recovering in record time from invasive C-sections. View the Trailer, Details, and Testimonials right here. This DVD is also available in a downloadable format for your iPad, iPhone, iPod or mobile device. Volume 3 being our Double Trouble Double the Fun workout DVD, with the perfect component of adding suspension training to your regimen. This DVD compliments Volume 1 and 2. If you do not have a TRX, never fear. It’s not required and I have an 8 week program that I can send to you, which provides modifications to the Kettlebell and Suspension Training combo workout in addition to rotating the workouts within the DVD. You will love this DVD if you liked Volume 1 and 2. This will get you working with double kettlebells. Time to DOUBLE the FUN and double the results!! This 2 Disc Set is the perfect compliment that really breaks down many of the technical exercises in a live workshop setting. Filled with Intermediate and Advanced exercises that will take your workouts to the next level. You will be given the tools to achieve incredible power for quicker fat loss during all of your workouts. The next best thing to being able to attend a live workshop. Taught by two of the leading female kettlebell instructors in the world. These workouts will hit you like a bolt of lightning. Once you have a solid foundation with your kettlebell training, this DVD steps it up. The workouts on this DVD are powerful, quick, effective and will be over before you know it. Designed for the busy individual who doesn’t have hours and hours to devote to exercise. These carefully designed combinations led by Alex Verdugo and Lauren Brooks. Download it or purchase the DVD. Check out our Strong Kettlebell Moms community page. Join the moms who have had the healthiest, fit pregnancies, recovered quickly, and returned to their pre-pregnancy shape fastest all with the help of this DVD. Prepare for labor, increase your energy, and muscle tone to stay healthy throughout your pregnancy and to recover with a quickness. Even those who have never been pregnant have enjoyed the workouts on this video. Great for everyone! Have the hard copy DVD shipped to you here or download only it here. Still can’t decide which DVD? Well you don’t have to! For the first time ever we are offering our ENTIRE DVD collection that will keep you busy for years in a price that is unbeatable. Receive 6 DVD’s with hours and hours of instruction and fat burning, strength, and sculpting workouts to keep you busy. PLUS our new comprehensive Kettlebell Book! Get in the BEST SHAPE of your LIFE once and for all. It’s time to make that change! Be the first to get the entire collection at this unbeatable price. Transform your entire body with these fun, smart, and efficient, and effective workouts!